Harmony and grace…depend on simplicity. Although we pride ourselves on our multi-piece, highly artistic donor walls and art glass murals, sometimes a client comes to us seeking something more modest, but still elegant and eye-catching. At the recent show of the American Association of Museums, several visitors to our booth were captivated by a photograph of our own Amri Studio Wall of Honor. They were drawn to how simple and flexible, yet sophisticated, such a wall can be. It glows with the soft, white-on-white look of alabaster. New names can be easily added -– indeed, entire rows or columns of plaques can be attached when the need arises. As one museum executive remarked, “Names can be removed, too.” This would be useful if you were honoring an employee of the year, for example. 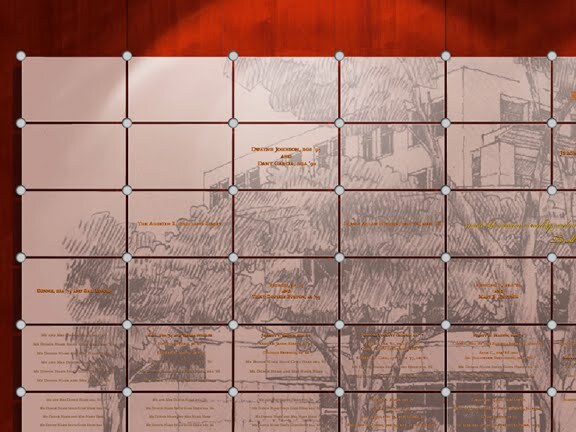 We are currently doing a Donor Wall like this for the new Robert and Judi Prokop Newman Alumni Center at the University of Miami. 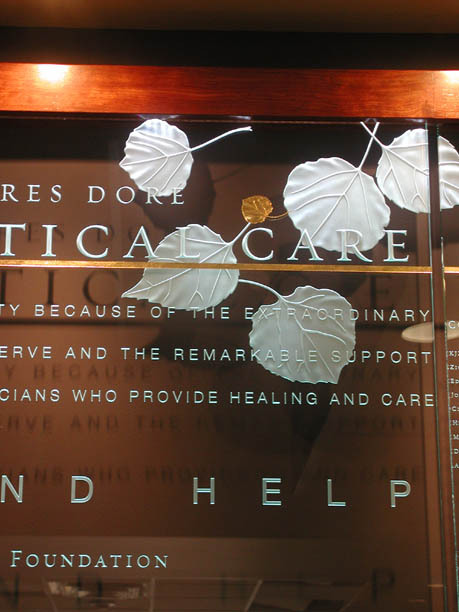 In addition to the carved crystal plaques with donor names, we are etching their beautiful hand-drawn architectural rendering into the frosted background to tie all the names together. 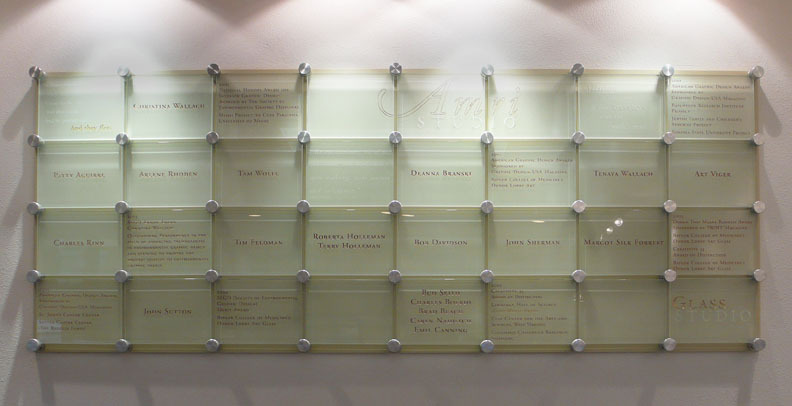 Our own Amri Studio Wall of Honor recognizes and thanks people who have made significant longtime contributions to our Studio’s success. It consists of 32 glass plaques (for now) lit by MR16 halogen spotlights. The text is deep V-carved and certain words are filled with with copper- and gold-leafing. The text highlights names, awards the Studio has won and inspiring quotations. Each crystal plaque is 8.5 x 6.5” and held in place by cylindrical museum-mount hardware custom machined for us in brushed steel. We did a comparable Employee Recognition wall for the high-tech giant Raychem. We consulted on and fabricated this Technical Hall of Fame with Mark Anderson Design Group (now Anderson Anderson Architects of San Francisco and Seattle), who created the design. The wall consists of elegant, interchangeable and updateable crystal plaques with honorees’ names interspersed with inspirational quotations and artistically carved department icons. 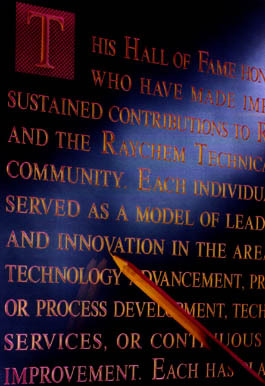 You can see the scale of the beautiful 3-D V-cut letterforms by the life-sized pencil pointing at the word INNOVATION, a key word for the team at Raychem. The aspect of my work that touches my heart most deeply is being part of what I call a culture of honoring. We are brought on board when a client wants to deeply thank and honor its donors for their generous support. 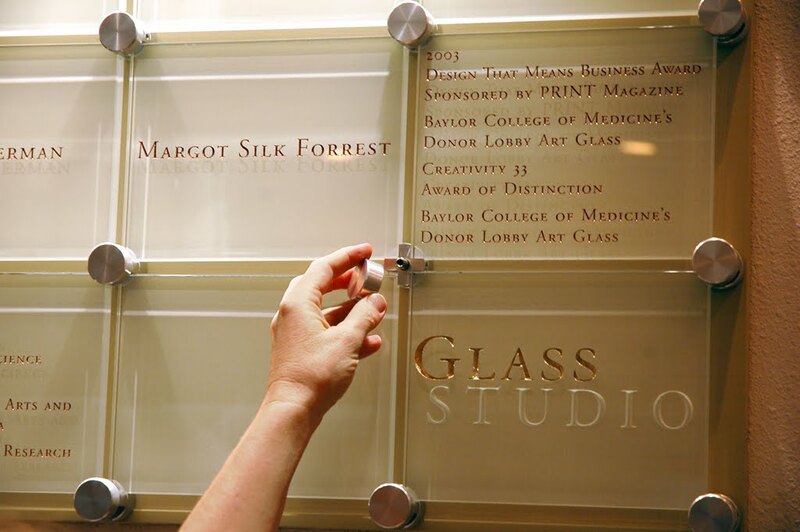 But for many years now, our studio has innovated Donor Walls that go beyond a mere “accountant’s list” of the names of big, medium and smaller donors. We understand that the entire community that contributes to an institution’s success needs to be honored. That why we weave into our artwork the institution’s identity -- you might say we "crystalize " the heart, mind and spirit of the organization -- along with the donors’ names. We foster a culture of honoring within our own Studio by thanking and recognizing our team members. One way I do this is by adding the names of significant longtime individual contributors to our Amri Studio Wall of Honor, which is mounted in our graphic design room. 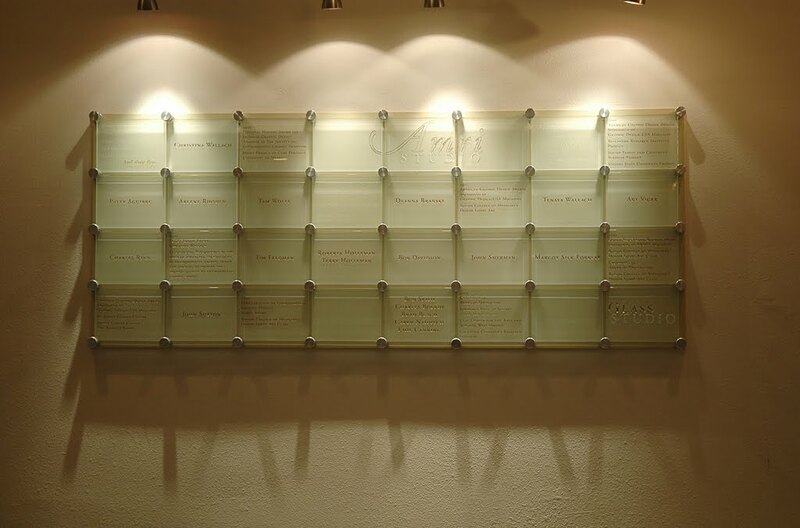 The wall consists of 32 glass plaques. 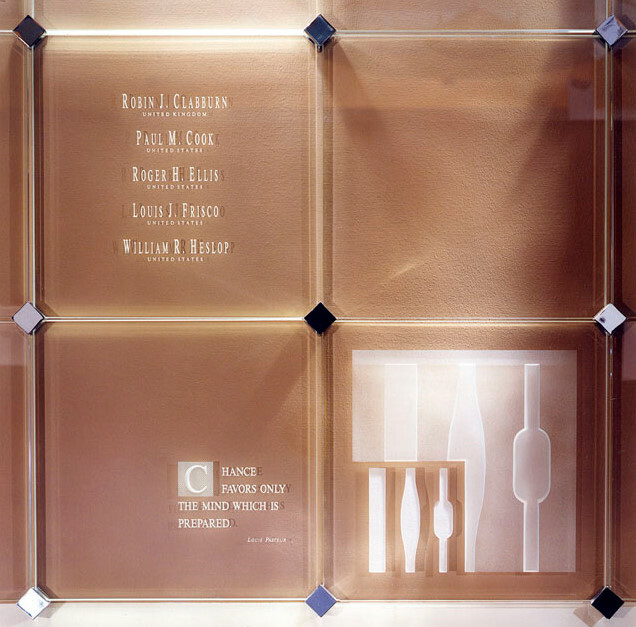 Deep, V-carved, copper- and gold-leaf-filled text highlights names, awards the Studio has won and inspiring quotations. As you can see, our Wall of Honor is designed so that it can easily be expanded with new names. We pride ourselves on being a "turnkey" Studio that provides our clients with every service from initial consulting to design and fabrication through lighting, cabinetry and complete installation. 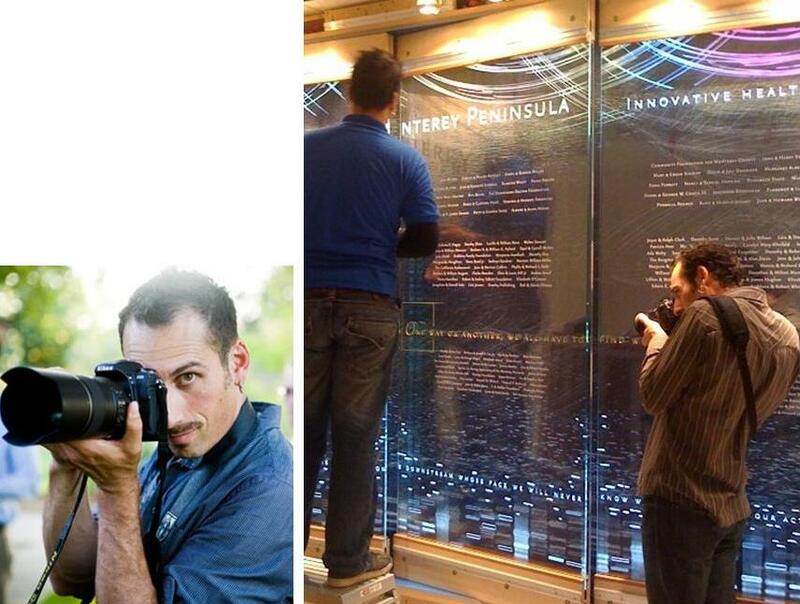 Today I want to honor everyone whose work goes into getting our huge glass and crystal walls installed at the client’s site. These are the people who drive or fly with me all over the country to ensure that our Art Glass is carefully hung and lit. They are a multi-talented crew and they rarely get much public acknowledgment. 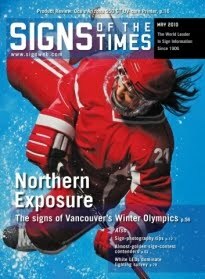 I hope you’ll enjoy reading about them even a tenth as much as I enjoy working with them! 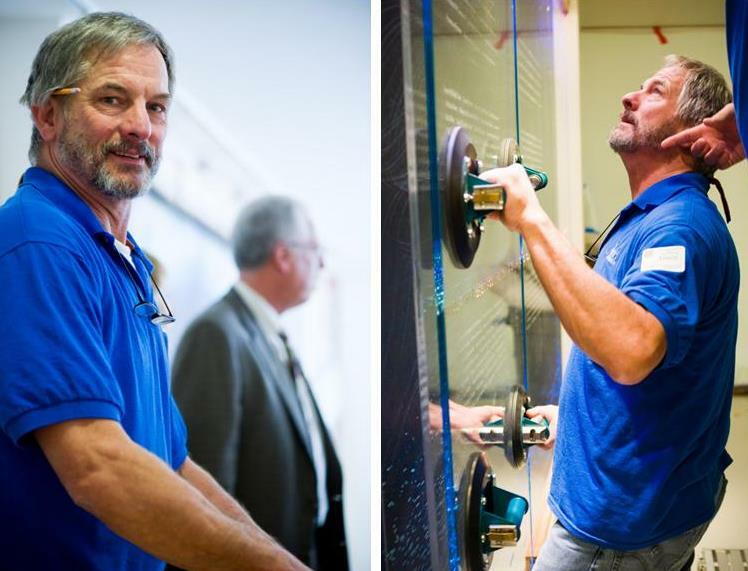 Before an installation even begins, we turn to our longtime cabinetmaker, Terry Holleman. 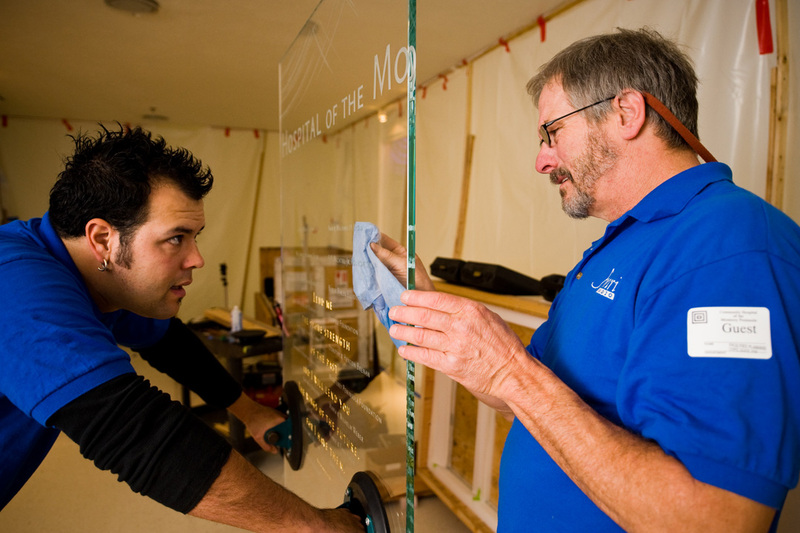 Terry is a hugely talented individual who designs, engineers and makes all the custom hardwood and Corion/metal lami LED mounting brackets, cabinetry and wall surrounds for the crystal plaques and murals we create. He is the owner and lead designer for Holleman and Company Cabinetry in Sonoma, CA. He is also a gifted fine-art painter. You can see his work at his website. 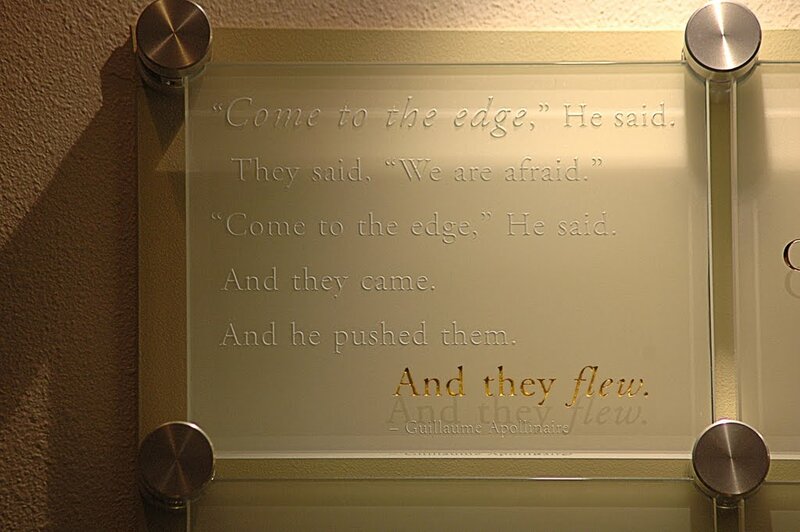 As permanent as our Art Glass panels look once they are installed, they can actually be mounted in hidden swiveling steel brackets for ease of access when it’s time to add new donor names onto a second easily updated crystal or clear acrylic layer. I want to give special honoring to the man who has designed, prototyped and machined all of our specialty metal components over the years. 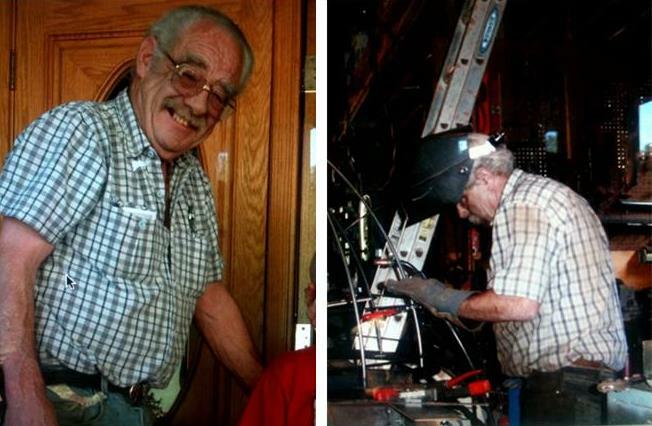 Fred Oberti was a brilliant, funny and talented machinist and a true gentleman. He passed away this year and I sorely miss him. Even during his last illness Fred insisted on finishing a final important project with us. THANK YOU, FRED! Fred’s swiveling brackets have to embrace an extra challenge because we use programmed LEDs to illuminate our Art Glass Walls. The hinges and other hardware that attach to the crystal panels must allow room for the LED wiring to run through them without impeding their function. This brings me to our lighting wizard and electronic engineer, Tim Feldman, who has worked with us for decades. 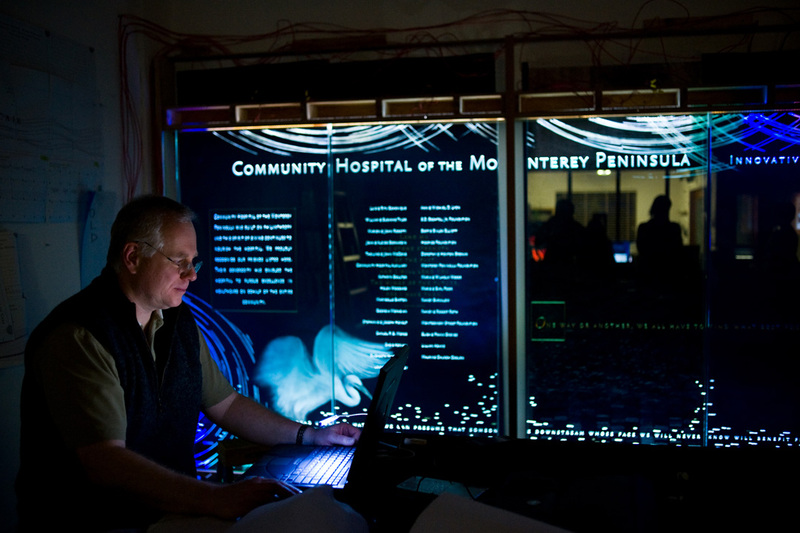 Tim creates custom-made strips of colored LED edgelights, which he can program to shift on a timed cycle or in response to the approach of a viewer. 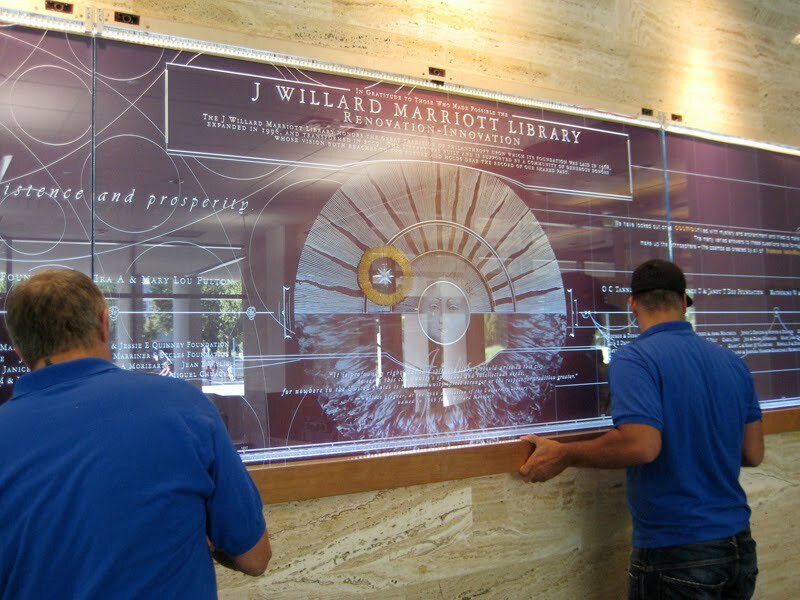 His work adds a whole new dimension to our carved and etched glass walls. Tim is the owner of Electric Algorithms in Davis, CA. He has created software and hardware for firms such as IDEO, eInstruction Corporation, D&P and Hewlett-Packard. With the brackets milled, the hardware machined, and the lighting programmed, the final pieces are in place for an installation. 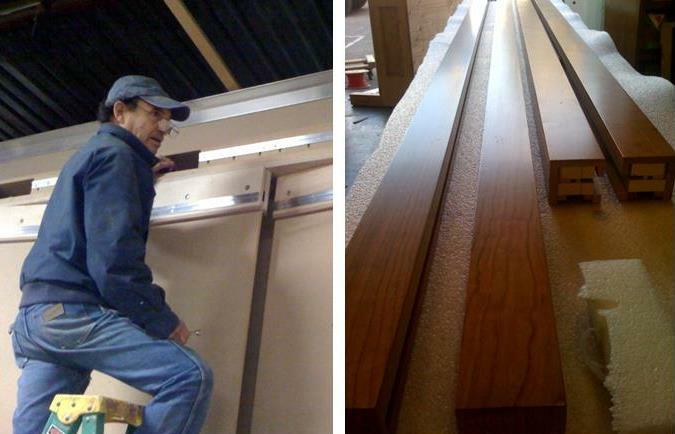 Our on-site install team is led by Charly Rinn, a talented and successful millwork designer and fabricator in his own right, who has been my lead installer for over 16 years. Charly has worked with me on just about every major installation I’ve done. He is the owner and founder of Exceptional Wood Products in Geyserville, CA. His firm does high-level, award-winning, contemporary and historic architectural woodwork, including stairs, molding, columns, wainscoting, cornices, door surrounds and cabinetry. Charly also designs and builds our custom shipping crates for the thousands of square feet of crystal panels we ship nationwide. Joe and Charly at the installation for Community Hospital of Monterey Peninsula. Below, Joe and Christina Amri. 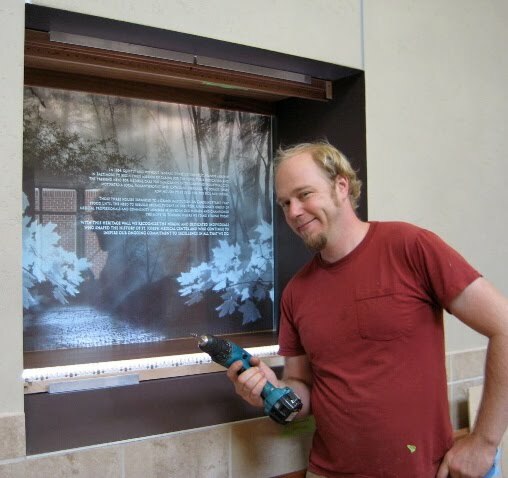 Another wonderful member of our install team is Jason Montgomery, a furniture maker based in Portland, OR. Jason is also a gifted musician who plays guitar and stand-up bass professionally. I am in awe of the multitalented folks I work with! We’ve made a recent addition to some of our install trips -- our talented new process photographer, Gabriel Harber of Oakland, CA, who gets some amazing shots of everything that goes on during an installation -- and of the folks who do it. He has a real gift for capturing the telling moment. Most of the photos in this post are Gabriel’s work. 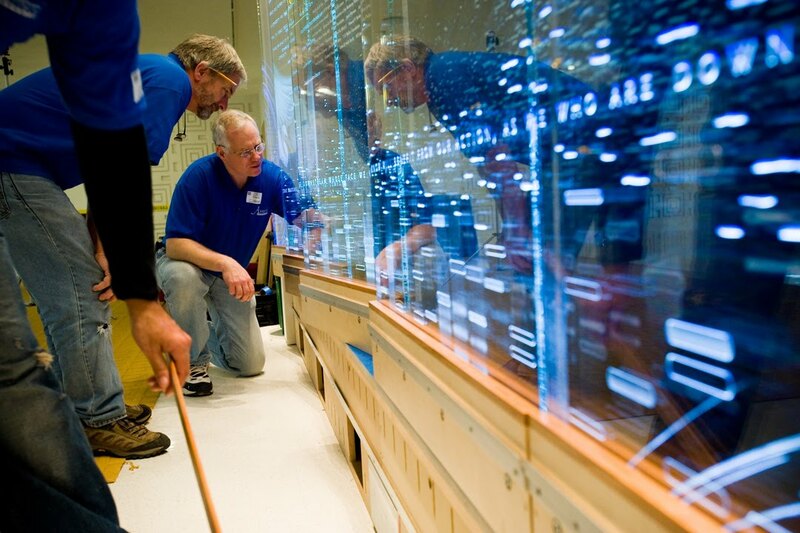 These are the folks who make it possible for our carefully designed and carved crystal panels to be mounted in hospitals, universities, and businesses across the country. 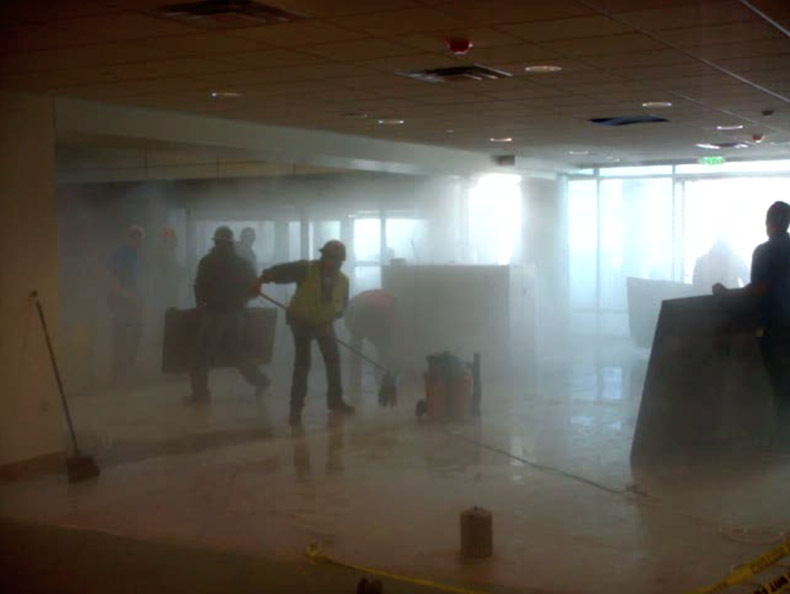 Their jobs aren’t always easy (like the day -- pictured above -- when temperatures of 17 below caused a water main to burst in the lobby of a hospital where they were installing a huge crystal mural), but they invariably handle everything that comes up with professionalism, grace and good-natured humor. 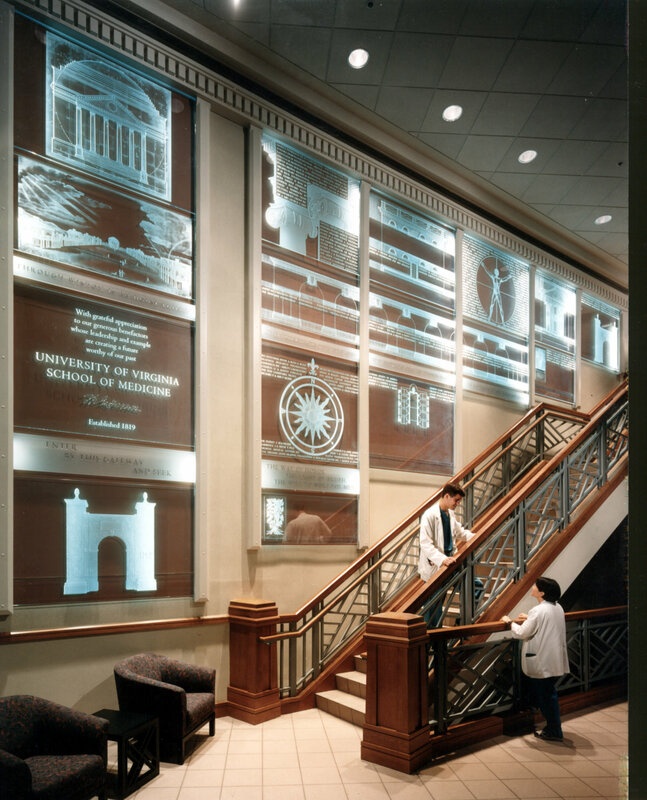 Lastly, I want to honor Bob Davidson, who took on one of our first, largest and most complex installations: the University of Virginia School of Medicine. A talented artist, art professor, architect and contractor, Bob guided, engineered, ran and collaboratively supported all the initial growth at our Studio. He built our sandblasting booths, the racks that hold our huge panels of glass, our glass-moving trolley, and even our second-story mezzanine. Without Bob’s loving and generous support, his amazing creativity and his problem solving skills, our Studio would not be here today! I thank you ALL for your talent and your heart. This loyal "band of brothers" has taught me everything I know about installation, enabling me to speak authoritatively to our clients. They have supported and admired the workmanship and art of our endeavor. And they have adventured with me through late-night airports big and small since we first expanded to creating truly large-scale Donor Walls 18 years ago. You are the best!